The Global Education Fairs are excellent platforms for students to get first-hand information from representatives of universities from across the globe. These events are attended by scores of overseas study aspirants each year, who relish the opportunity of getting comprehensive information about renowned universities from different countries, all under one roof. Top universities from popular study destinations including the United Kingdom, the United States, Canada, Australia, New Zealand, Ireland, Singapore, Germany, Dubai and Malaysia among many others, are participating in this event. The purpose of this event is to provide you with all the information you will need while finalizing your plans to study overseas, ranging from programme selection, the applications process, scholarships you can avail, education loans to fund your aspirations and the visa process to study at a country of your choice. 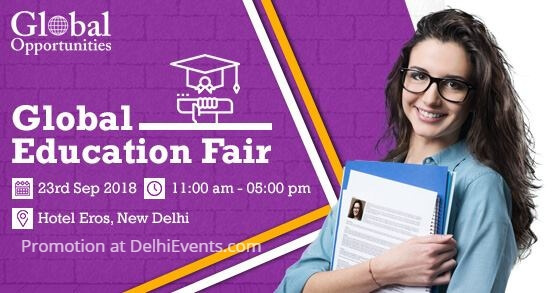 Attend India’s biggest education fair and choose from 80+ Institution representatives to meet with and see your dream become a reality. Chance to get fee waivers* & scholarships*, FREE entry for all. To help us expedite your admission decision, please bring your original Academic Transcripts, Statements of Purpose, Letters of Recommendation, passport and English proficiency test scores to take the advantage of on-spot offers. To save time at the venue, it is highly recommended that you pre-register online and visit the Global Opportunities office prior to attending the Global Education Fair. We know that you will be seeking the advice and guidance of your parents, family and friends when making your decision, so we are pleased to extend our invitation to them too.